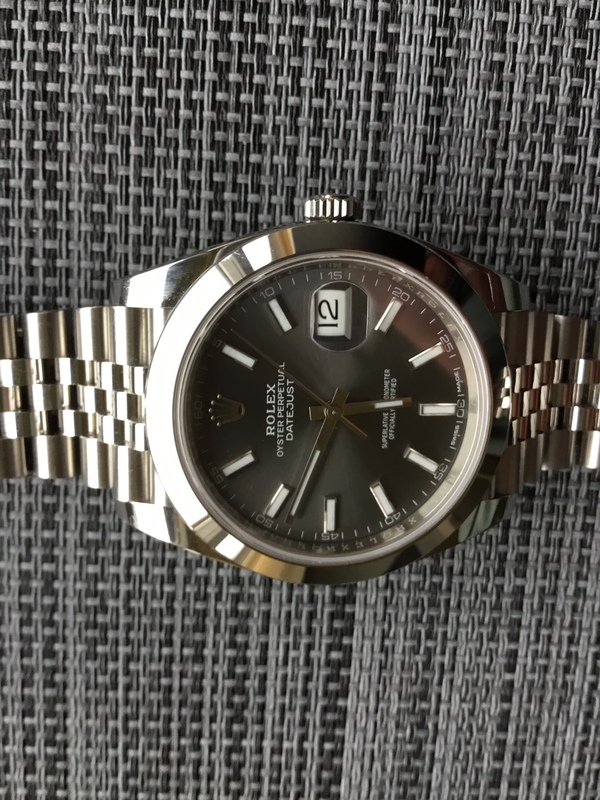 Thread: Datejust 41 as a "one watch to rule them all"
I've been an Omegan for years but I have a big birthday coming up & Rolex has been on my mind. By way of research I've tried a Hulk & a no date sub. I wanted to like them both but neither "spoke" to me - that's the third time a Sub has left me cold. I tried a Polar Bear Explorer & that didn't work for me. I tried a Rootbeer & quite liked it but right out of left field was a Datejust 41, Oyster bracelet & smooth bezel - really liked it! 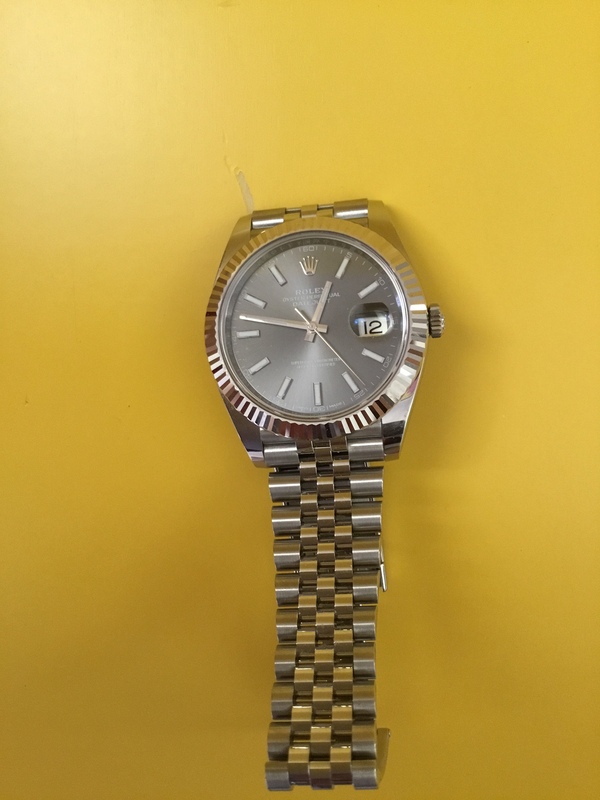 I guess my question for Datejust owners is this; is it the watch I think it could be - utterly reliable, looks good with everything, smart or casual, doesn't scream "ROLEX" loudly enough to attract muggers in the next county, in short, could it be the "one watch"? Could easily be an only watch, and is for most DJ owners. I could use my DJ2 for anything and would be more than happy with it as an only watch if it came down to it. It feels bullet proof and looks sensational to me. When I wear older model DJs (36mm oyster bracelet and smooth bezel 16000 or else an Oysterquartz 17000) they tend to stay on my wrist longer than any other watches. There’s just very little reason to change to anything else, they go with everything and are just kind of faultless. The 41 is a pretty good upsized modern take on the same theme and would probably work the same way. Though if buying new I’d also be tempted by the new dial 36mm DJs launched at Baselworld, or the black / white dialled Oyster Perpetual 39s. The black dial strikes me as a very plausible ‘one watch’. IMO the DJ41 does scream 'Rolex' because it's absolutely massive and is far too big for most wrists. I would think the 36mm would be the best option for anyone wishing to fly 'under the radar' although no DJ could ever be considered bland. As stated, the new ss 36mm comes with new movement too. Bonus! I have a 7.75" wrist so the 36mm would be a bit small but I take the point of a DJ working in most contexts. I'm a bit surprised that the Oyster bracelet is a bigger giveaway than the Cyclops but I can see how it might be. Interestingly, nobody's yet said that the DJ is NOT the watch for all seasons. Have owned a GMTc but for some reason I never bonded with it so sold it on - weird but I think I knew from the onset that it wasn't a keeper. My wife has just retired and suprised me last week with a DJ 41, smooth bezel, oyster bracelet with black sunburst dial and I can honestly say I'm smitten. Whether that's because it is a special gift I can't be sure - I think though, it's because it encapsulates how a watch ought to look - three hands, date at 3 o'clock and a simplicity which harks back to 'learning to tell the time' clocks. Yes, for me, it could easily be an 'only' watch. I had a DJ41 with WG fluted bezel. Nice watch but at that price point the stuff from Grand Seiko and Jaeger Le Coultre is in a different stratosphere from a fit and finish perspective (plus the DJ doesn't have quite the bulletproof residuals as the SS Sport range) so it quickly went. Older is in so many ways wiser which must tell us something about the DJ. My brother has a 36mm DJ which he loves but I find a little small so I’d probably go along the OP39 or explorer route. I have the 36mm 116234 and it could certainly be my only watch, looks good with almost anything. ‘A different stratosphere’? I think not. It’s a beautifully made watch, and an outstanding candidate as an only watch. It would probably be my choice, with the smooth bezel. And as for fit and finish. Compare a Jubilee bracelet with any bracelet from GS. No contest. And the Rolex will be more robust and reliable than any JLC. In the real world, that matters. As for the Milgauss, I did live with that as an only watch for two years. Great design and a future classic, I think. Personally, I find both the DJ41 and the Milgauss more interesting watches than the ‘sports’ models, without all the tiresome baggage. Last edited by paskinner; 16th April 2019 at 09:59. I have a Milgauss that I love as well as DJ41, the Milgauss out of the two stands out for me. However my daily wear for the last few weeks has been my black daytona with my z blue in the evenings. well being old anyway I can vouch for any datejusts with smooth bezels being understated and a go with anything/ anywhere watch ( with may be a dive suit being a exception:-) ) so much so I have two ,a DJ2 white on oyster , and a DJ41 rhodium on a jubilee , and neither are 36 mm and neither look too big on my 7 3/4 inch wrists . It’s far from massive in DJ41, and a lot smaller than the Subs and GMT's and even the DJ2. The 36mm was just a little too small for a lot of potential buyers, and thankfully Rolex have now addressed that in their current line up. I'm wearing my blue dial DJ2 today. It's all the watch I would ever really need. I tried the 41mm on and it was far too big for my 7.25inch wrists. 36mm however was perfect in a DJ. Subs and GMTs wear MUCH smaller than the DJ41 due to their sports bezel. I regularly wear a GMT2c but would not entertain a DJ41 (or DJ2 obviously). I'm looking at a rhodium or a blue dial model. My wrist is 7.75" & my other 2 watches are 41mm (Seamaster 2254) & 42mm (Speedy Pro), so I reckon the sizing is about right for me. I tried one & it felt fine, though (obviously I guess) a little light after the other two. Having a dive watch & a chronograph, the DJ41 really feels like the way to go. Too big for a subtle everyday wearer for me. I would be happier with the 36mm OP which does away with both the cyclops and PCL. 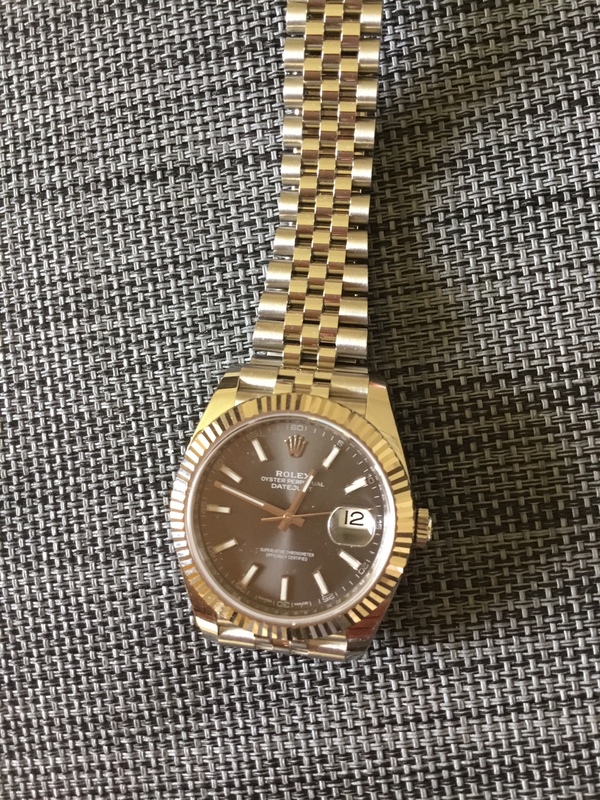 Ive wanted a datejust for a while now. Reading threads on here, it seems to suggest to opt for the 36 one. I tried on both the 36mm and 41m in Heathrow in January. Im glad I did, as I found the 36mm way too small wearing for my liking on my wrist...the 41mm also I found wore small on my wrist. I was a bit dissapointed ...but glad I tried them on! Everybody has different preferences for watch sizes etc..."personally" though, for me...they both wore small on my wrist.. I dont have a big wrist either! Im about 18cm wrist. On the sizing and proportions, while I much prefer the original size personally, it will all depend on your individual build, height, wrist size and taste. But also, how far away you are from the watch. In common with many modern watches, the 41 is designed to look right from a couple of meters away, even on a slim wrist. I was quite surprised by how it worked, standing some distance from a full length mirror, even with a 6.5” wrist that could only just about manage it close up. It seems modern watches are designed to be viewed by others, while older watches are for ourselves. Personally - and sorry to say this yet again but I can’t help it - I wish they’d stopped at 38mm and kept the proportions relatively true to the original. There’s a lot of bezel on the DJ41 (and a lot of case and dial on the OP39). But inevitably some just need something larger. I’m always looking for the non-existent midsize. It could well be true that current Rolexes are intended to be ‘seen’ by others; the strongest example would be the coloured bezel versions. The GMTs, Hulk and so on just shout ‘Rolex’ in an unmistakable way. Mind you, even in the 50s, a yellow gold DayDate was intended to be very obvious. DJ41 | smooth bezel | Oyster | blue dial is my work and smart casual goto watch. but is the jubilee better with the fluted bezel?? I had the blue dial 41 with smooth bezel and Jubilee bracelet. 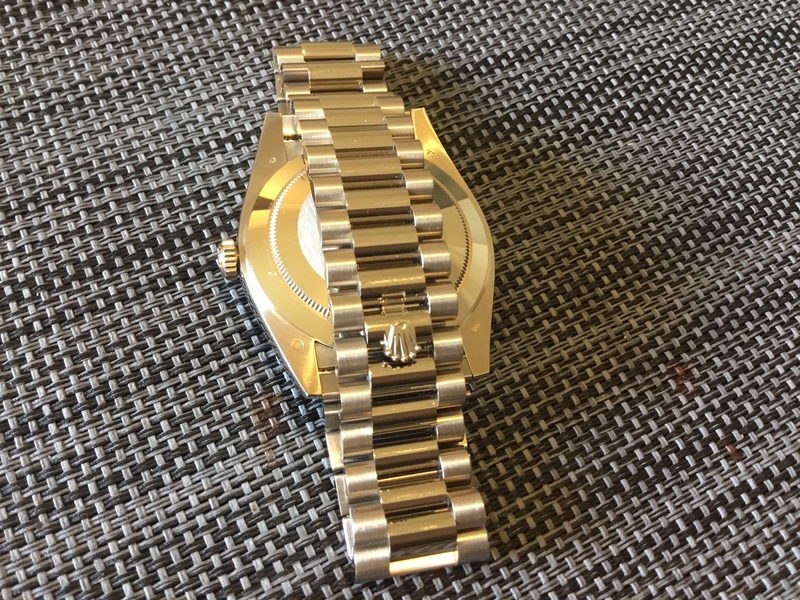 Size wise it was perfect for my 7:25" wrist, but you post a pic on here and all you get is it looks better fluted, it looks better on Oyster, it looks better in 36mm. I thought thanks guys and sold it. That was my exit from Rolex. I don’t understand that; it was your watch, paid for by you. Why do you care what other enthusiasts think....it’s not their watch. For what it’s worth, I think blue dial/smooth bezel and Jubilee is a great spec. So is 41mm. I think we get over fixated by size. If you take a look around you, you will soon notice that 36mm is still larger than the average watch on the average wrist. I have a 7.5” wrist and all my DJs are 36mm. I think they look spot on. Er, it's not when I look around the various offices I am working in... Unless we are also including the women's watches, but even some of those are 36mm and above on the wrists around these parts. I own the smooth bezel 41, black on oyster and whilst I don't think I'll ever be a one watch guy it's certainly my go to Rolex now. It's so much more versatile than the sports range and mine is a keeper....probably. Try going out into the streets where you get a better representation. You see the odd saucer but 36mm is still a decent size. Certainly not small. 41mm too big in my opinion. I'd go for the 36mm for my 6.75" wrists. On DJ size I have both the 41mm and the 36mm and find they both fit my 6.75” wrist well and have no complaints. On a 7,75" wrist I may well think the same. It's a personal thing though. Love my smooth bezel sunburst blue DJ. If i will buy the next one it will have to be a fluted bezel DJ. That has a different appeal. Agree about the subs. Add yachtmaster to the list. Very under underwhelming. Each model size wears a little different. I feel the 2254 wears much smaller than 41. I once bought a 38 Breitling, but when I for it home and put other Breitling 38 on it appeared smaller, like a 36. Both measured 38. Thickness, bezel depth and put length make a huge difference. Was a learning experience about future watch buying. Just try on the model you like and if your happy great. Changing sizes and models really confuses the brain. Its really bot even close. As for the GS bracelets the ones on the c£5k+ models have superbly finished edges, multiple finishes on the links. Where GS bracelets fell below Rolex was on the clasps but that was vs Sports Rolex. Its moot when it comes to the DJ and I'd go as far to say that something like a GS Snowflake is finished to a materially higher standard than a DJ and that includes the jubilee bracelet. Doesn't mean the GS is a better watch as the DJ41 has a cracking movement but as a piece of workmanship it's not even close sorry. Same applies to JLC they are in a different category to Rolex. Rolex is the BMW of watches. Perfectly nice and well built and reliable but there are far more refined vehicles out there. Yes and I now have this one; thank you Ken. It’s the only Rolex that has a chance of being a keeper for me. After subs date and nd sea dwellers gmt2s and even Daytonas all briefly enjoyed and then moved on I now have settled on Ginault as my sports Rolex substitute. The 41mm DJ is perfect for my 7.5” wrist; I love the smooth bezel and the Jubilee bracelet is a tour de force. OP you will not regret your DJ41 purchase if you go ahead. Having had a serious problem with the quality of a GS dial....faulty , poor quality plating and indifferent servicing.... I would see this rather differently. I like and buy GS, but I’m less starstruck these days. Overall, they lag behind in guarantee and servicing. Which is reflected in indifferent residuals. And having waited six months to get a JLC fixed, I’ll give that company a pass. Last edited by paskinner; 16th April 2019 at 20:40. But -- and forgive me -- is there a difference between the a smooth-bezeled DJ and the OP apart from the date / cyclops? I was in a similar situation last year and decided on a 41. It Is a watch that I will never sell and will still look right when I am 70, over the last six months I have only been wearing it (rotating with a gshock if I am going somewhere where it isn’t appropriate). It lasts for the best part of three days before stopping. I still hanker after the sports models but when I tried them on they just were not right for me, for me they felt like big boys toys and I didn’t think that I would keep one forever, with the dj I did, so I bought it new. I considered a birth year 41 but they were too small, and a no date sub was too hard to find. To be honest I don’t really see the benefits of the sports models apart from residuals but that’s just me, so I will leave them for those that do. I went for the rhodium dial, fluted bezel and jubilee, it’s lovely but quite reflective. The size is right for me, depends on the size of your wrists, I needed an extra link but it is very comfy on the wrist. Mind you, if you are on this forum I very much doubt that there will ever be “one watch to rule them all” but its fun trying to find them. 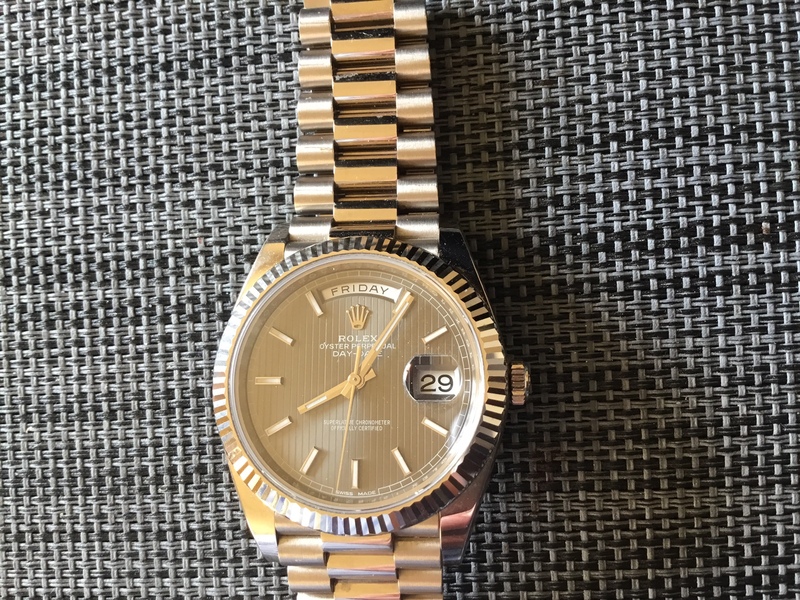 I wonder if it’s generally realised how visually similar the Datejust is to the DayDate . One costs multiples of the other, because it’s gold, but look. Then the DD, bracelet first. lovely hidden clasp.The drawback is a loss of adjustment, the DJ bracelets are more useable in that sense. Incidentally, to me, the current DD feels the best built watch I have come across. Pretty flawless . Last edited by paskinner; 17th April 2019 at 09:00.